Allan still in DC; posted by his mystery side-kick. “WILL NOT SELL OUT TO THE YELLOW KID”. 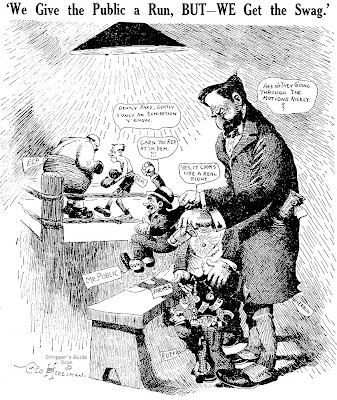 Again, three self explained cartoons on the master-servant relationship between Herrin and Gillett. All the characters have already been introduced excluding “Bell” (the “Trilby Bell” manouvered by the evil “Svengali” Herrin as in George Du Maurier’s novel). “Bell” was Theodore A. Bell from Napa (see http://en.wikipedia.org/wiki/Theodore_A._Bell). He was a Democrat but he was strongly anti-Hearst as the (democratic) publisher had created an independent current called “Independence League” (formerly the Municipal Ownership Party”, see blog posting of July, 3) which backed William H. Langdon, D. A. of San Francisco. 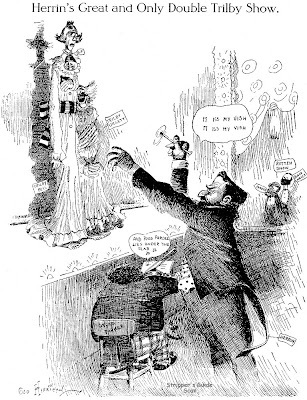 The Los Angeles delegates declared that “they will not sell out to the Yellow Kid”; Bell (who, eventually, lost to Republican Pardee) was nominated by acclamation, and “Hearst was kicked down the party stairs”. 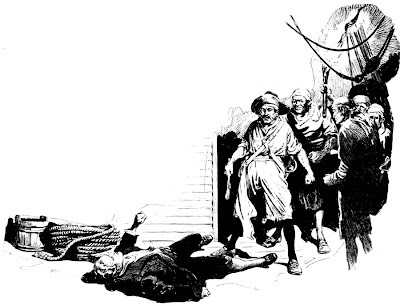 This is the reason for which Hearst and Herriman put Bell as an accomplice of Gillett in the villains’ ranks. STUFF TO LOSE SLEEP OVER. 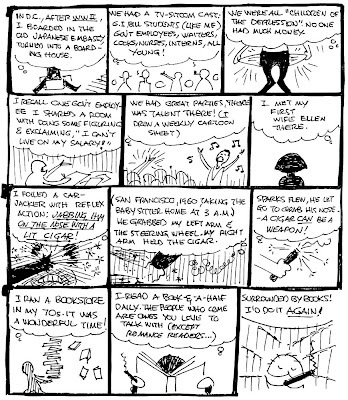 Just to torment Allan while he is frolicking in Washington DC with a mystery that can interest no more than three people in the world (maybe): on the June 24 2006 blog posting (Chicago Chronicle Comics – IV, “The Tweedledum Triplets”) Allan wondered about William F. Marriner’s unusual presence in a Chicago paper. 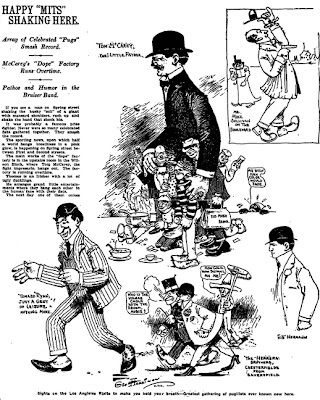 Well, in the same year (1903) the series (or, at least, the installment “Tweedledum, Twedleedee and the other triplet”) was published by the “Evening Telegraph” of Philadelphia, where Marriner had worked for many papers, and where (I think) the strip was more logically originated. May there be some tie between the “Chicago Chronicle” and the “Philadelphia Evening Telegraph”? Or betweeen the “Chicago Chronicle” and the Philadelphia papers in general (remember the “Deacon Backslider” – “Binnacle Jim “cases)? This is stuff to lose sleep over, to paraphrase a NEA cartoon! Tomorrow I am leaving for Washington, accompanying Jim Ivey to the AAEC (Association of American Editorial Cartoonists) convention. Jim was a founding member of the organization and has been invited (with some helpful lobbying of the AAEC by R.C. Harvey) to attend their 50th anniversary convention. 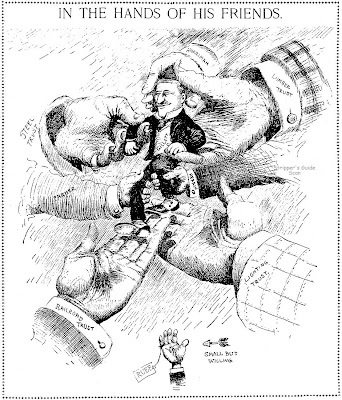 January 8 1906 (Herriman’s 1st cartoon for the LAT) Bourke Cochran was the Tammany (Democratic) congressman for NYC. Tammany was anti-Hearst since he launched his Municipal Ownership Party for the mayoral elections of NY in 1905, hence the vitriolic comment. February 4 1906 – Tom McCarey was a boxing manager; Mike “Twin” Sullivan, Tomaso “Tommy” Ryan and “Kid” Hermann were boxers. 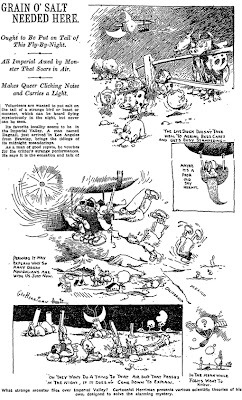 June 1 1906 – A “Mystery Airship” had been occasionally sighted over California since 1896; sightings of strange UFOs like the one in the cartoon (long and interesting story!) continued for many years. 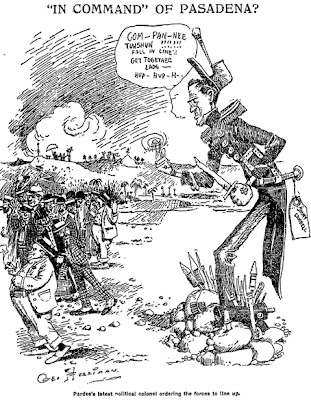 August 13 1906 (Herriman’s last cartoon for LAT) – At the Republican caucus in Pasadena (August 12) the "Machine" representatives did not support Governor Pardee (who lost the election in favor of Gillett, see “Herriman Saturday” blog post of June 23) in spite of the backing of Jimmy Campbell, whom I don’t know (a “Dr G. W. Cambell” was also left at home at the convention, maybe he was known as “Jimmy”). The little fat man at the left closely resembles the mystery “Little Fat Person” of the June 23 blog post. I understand that he was considered by some as a local nut for his militaresque manners. He ordered the Republicans at the caucus to form “as one man” a “solid phalanx” around the Pardee Banner, but they didn’t obey. Congrats to Jim for getting the recognition and making the trip! Hopefully you will have a full report and pictures when you return! Years ago, so many I'd have to count back on my fingers to remember just when, about 1904, if a finger hasn't dodged me, I frequently received letters from a Mr. Grissinger, of Scio, Ohio, telling me about a son of his that had a "bent" for drawing. 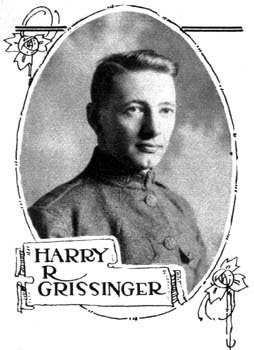 Unlike some parents, Mr. Grissinger wanted to give this son, Harry, a chance, and the outcome of the corre­spondence was that Harry was en­rolled for an art course in the old Acme school, then a flourishing institution - with a bit too much "flourish" that even­tually resulted in bankruptcy. Harry wasn't one of these "geniuses" we hear so much about, but seldom - if ever - see. He was just a bright, earn­est young fellow who wanted to be an artist bad enough to dig in and do the necessary hard preliminary work lead­ing up to meritorious original compo­sition. Harry did not start in with the idea that a few months of easy work would enable him to make $100 a day, or, if he had any such notions at the start, they were soon knocked out of him - without knocking him out also. Many an art student makes the start, but it takes grit and detemination and a goodly amount of exceedingly hard work to win out, and when the average student commences to find out about the hard work he is apt to get the proverbial cold feet, that turn him around and take him back to a warm spot where he can bask in the sun and take it easy. Harry had the right kind of feet, or at least his head was able to govern them and keep them in the path of ar­tistic progress, tho, perhaps, there was a slip or two in the early days, the record makes no mention of them. Thus old father Time bumped along for several years without Harry accom­plishing anything that entitled him to a niche in the Hall of Fame; he was just a good student, faithful and per­sistent. It was during this study per­iod that Harry had his first drawing printed in the old Student's Art Mag­azine, familiarly called SAM, now Art and Life. During the year 1911 Mr. Grissinger went to Chicago and from that period up to 1915 he worked in various en­graving houses, freelanced, and did special work for The Western News­paper Union and the International-Press bureau. 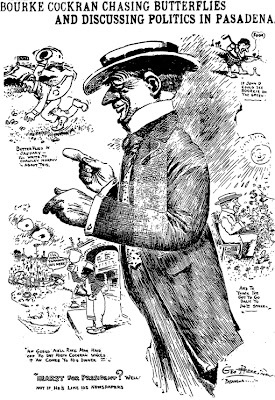 In 1915 he accepted a position with the W. D. Boyce Co., publishers of Sat­urday Evening Blade., The Chicago Ledger, Lone Scout, Farming Business and Home Folks, and did work on all of these publications along the lines of fiction, news and comic illustrations, cover designs, etc. During the World War entered the army but received an injury while in training so did not cross the pond, was honorably discharged and resumed his old job with the W. D. Boyce Co., with whom he continued up to the year nineteen hundred and twenty-four. 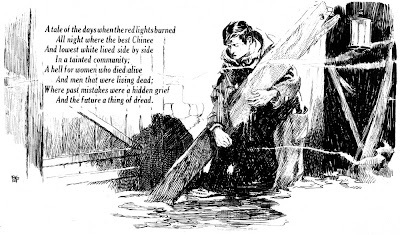 During the above period he did considerable freelance work for outside publications including many story illustrations for The Boy's World, The Girl's Companion, The Young People's Weekly and Countryside. 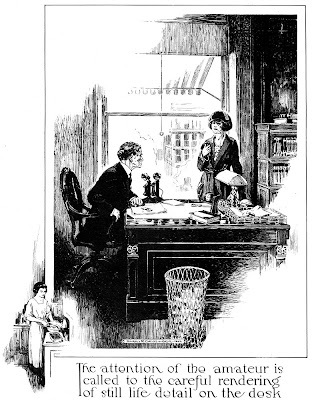 In nineteen hundred twenty-four he accepted a position on the Sunday staff of Hearst's Examiner, illustrating stories, news features and articles both serious and comic, by such writers as Rubert Hughes, Mary Roberts Reinhart, George Shaw, George Ade, Will Rogers, etc. And, as the fairy story says "There he is to this day". . 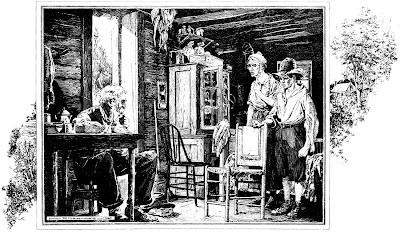 While much of Mr. Grissinger's work has been along comic lines and his comic work is good, having an individuality about it quite different from the work of any other artist in the comic field, yet his important work is serious illustrations, and it is into this field that he expects soon to enter, exclusively. The making of an illustrator takes a long time. There is so much he needs to know, so many things he must draw with accuracy and feeling, before he can properly interpret an author's ideas into pictorial form and supplement a manuscript with illustrations that really illustrate. The illustrator must be more than a mere draughtsman, he must have the intellect to appreciate the theme he is given to illustrate, must be able to enter into the spirit of his task with a high idealism that makes his pictorial interpretations a substantial addition to the authors work. Besides being a fine draughtsman, Mr. Grissinger is a student, not an "academic" student entitled to any B.D's or P. H. D's or - well possibly he has some B. V. D's, but we'll let that pass. The idea we wish to convey is that he is a student of the BIG school. LIFE, an earnest reader of good books and magazines and, also, that he does his own thinking, and has passed the stage of letting the other fellow tell him what to "believe" and "how to vote". For years he has looked forward to the time when he could get into high grade magazine work and we predict that that time is in the very near future for Mr. Grissinger is eminently capable of producing the finest kind of pen illustrations, and really good pen draughtsmen are few and far between. There is no instrument of art quite so difficult to master, nor is there any medium so effective and appropriate for illustrations that supplement the printed text. William Morris, the great English artist held tenaciously to the idea that the pen rendering was the only kind that properly went with printed type. We are pleased to be able to present a few of Mr. Grissinger's pen renderings in connection with this article, and on following pages, as samples of meritorious work. You may soon expect to see his work appearing in the large magazines. I visited Jim's store in Orlando on a trip to Florida in 1991. Such a great store to find in the lower right corner of AMerica! I found a lot of great back issues and asked if he was the same Ivey who'd edited a collection of Wash Tubbs strips. He was, it turned out, and he went into his back room to show me a copy that had end-papers with color drawing by Roy Crane!!! One of the most memorable bookstores I've even shopped in.